Now that I am current on all my blog postings, I thought I would write a little something about this pregnancy. We are definitely in the final days and we can't wait to finally meet this new little addition to our family! In many ways this pregnancy has been so much like my first pregnancy, but in many ways it is so different too. 1. Hardly any sciatic pain!!! I am almost positive this is due to the fact that up until last week I was still working out. 2. Movement: this baby has been trying burst out of my belly for weeks now. If I had to pick one thing making me uncomfortable this pregnancy it would be that. 3. I now have an "outie" belly button! This is the only picture we have taken to purposefully show my belly growth (39 weeks and 1 day) throughout the entire pregnancy. 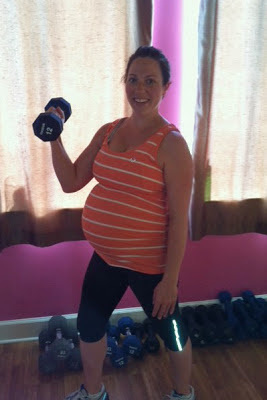 With the exception of my 1st trimester, I have attended boot camp on average of 3 days per week this entire pregnancy. At our last doctors appointment we were told the baby is in the proper position for delivery and I was already progressing nicely. So our bags are packed and we are just waiting for nature to take its course!